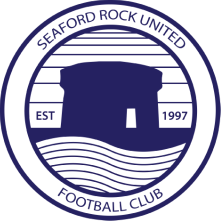 Seaford seconds recorded a second consecutive win with a composed and confident away win at Balheary Reservoir, despite finishing the match with just nine men. There were minimal changes for Seaford from the previous win over Glasnevin, with Alan Brennan and former Longford Town man Jimmy Hussey coming into the midfield for their first starts for the club. Seaford started brightly, with Brennan's early overhead kick floating just over the bar, and took the lead on 16 minutes. Hussey's floated free kick lured Swords keeper Tony Murphy off his line, but winger Mark Cullen rose bravely to divert the ball into the net. And the visitors' second bore a close resemblance to their first. Midfielder Marc Smith was floored by Aaron Leahy on a burst forward. Again Hussy curled the ball in, this time from the opposite side, and again Murphy failed to claim it, the ball bouncing into the net off Leahy's knee. Murphy redeemed himself early in the second half with a sensational left-handed save to deny Andy Roe's header from yet another Hussey delivery, before his opposite number at the other end, Dylan O'Reilly, produced a reflex stop of his own to denGavin Purcell's powerful effort. Seaford put the outcome beyond doubt on 65 minutes following Tony Bennett's burst down the left, his deep cross finding Andy Roe at the back post, and Roe controlled perfectly before picking his spot with his left foot to make it 3-0. However Swords pulled one back almost immediately when Leahy made up for his earlier error by lashing a low left-footed shot past O'Reilly from the edge of the box. As the game opened up, either side might have scored a further goal. Hussey fluffed his header wide from Robbie Murray's fine cross, before O'Reilly produced another good stop to keep out Josh Cole's snapshot. The match ended on a sour note for the visitors as both substitute Frank Mulhall and Smith were dismissed for dissent, a particularly disappointing outcome given the entire match was generally played in good spirit without a single bad tackle or ugly incident. However, in a wide open division, a second consecutive win , despite a number of key absentees, provided a lot of encouragement for Seaford.